Scientists at Massachusetts General Hospital and Harvard Medical School have shown that mutations extending lifespan in the experimental roundworm C. elegans induce expression of germline genes and pathways in somatic cells. 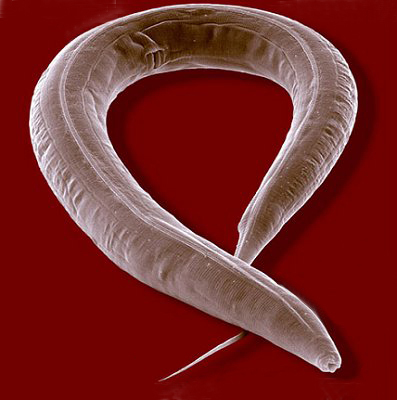 "C. elegans mutants with extreme longevity accomplish this feat, in part, by adopting genetic programs, normally restricted to the germline, into somatic cells," said Dr. Sean Curran, the study's lead author. "We know that germline cells are more stable than somatic cells--they live longer and are more resistant to stresses that damage other cells--and understanding the molecular pathways involved in that stability may someday allow us to devise therapies protective against age-related decline in other tissues." Earlier, senior author Dr. Gary Ruvkun and other researchers had discovered that simple mutations in genetic pathways conserved throughout evolution can double or triple the lifespan of C. elegans, and that similar mutations in the corresponding pathways also dramatically extend mammalian lifespan. "The idea that somatic cells can reacquire genetic pathways usually restricted to germline cells is fascinating, and since germline protection is seen across species, the activity of these genes may play a role in controlling mammalian lifespan," said Dr. Ruvkun. "Understanding the mechanisms involved in this transformation could help us develop new ways to repair and even regenerate key cells and tissues." Dr. Ruvkun was a co-recipient of the 2008 Lasker Award for Basic Medical Research for his role in discovering that tiny molecules of RNA can control the activity of critical genes. The current research was published online in Nature on June 7.